A wonderful flamenco dancer brings us closer to the best shops and designers in Madrid. 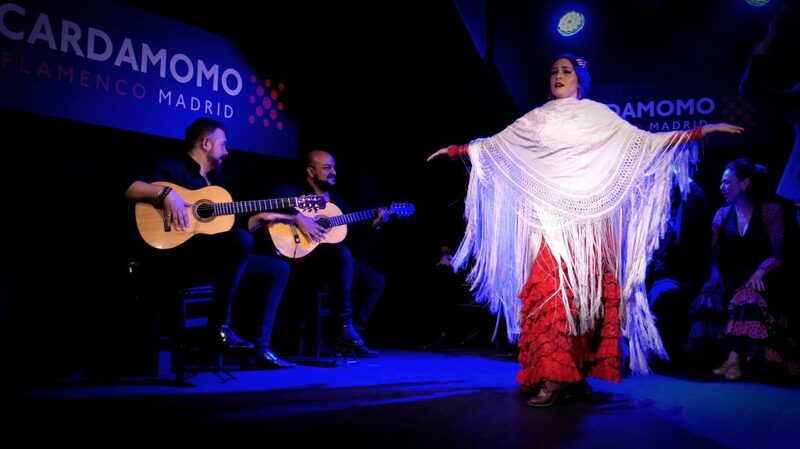 Paula Rodríguez, one of the stars of the flamenco show in the Cardamomo tablao flamenco, takes us on a tour of the most significant corners of flamenco fashion in Madrid. The dancer opens the doors of her house and her wardrobe to show us the immensity of variations that exist within this dress, a symbol of spanish culture and flamenco art. We immerse ourselves in the origins and evolution of the flamenco costume with Paula. Besides being one of the most virtuous flamenco dancers with the shawl, she is an expert in flamenco fashion and is also in her design. The dancer dresses in style, elegance and joy. Choosing for each dance stick the right dress, and its ideal complements. Whether you want to buy your flamenco dress finished, as if you want to create from scratch from fabrics, Paula gives us the answer. Equally important that the costume are the shoes, the flowers or the petticoats that complement the stylism of the flamenco. A fashion that is not fashionable, and you can dress in Madrid. Paula Rodríguez takes all her life to dance, dressing herself with polka dots, lace and flowers for joys, tangos and Soleas. Nowadays, he does it every day in the flamenco show Madrid (18:00/20:00/22:00). She knows the best places of flamenco fashion in Madrid to get your suit and feel a real flamenco, beautiful and goblin. Are you coming to visit with us? She has humble beginnings, of the peasant women, of the gypsies. In short, they made their own clothes, imagine, with fabrics that could be equal from a curtain, than from an old sheet, than from a pretty cloth they’d found. They made their mandiles ( aprons) her flamenco clothes, her gypsy clothes. From the age of 3, I woke up and I spent a whole month telling my mother that I wanted to dance, that I wanted to dance. And then, to buy me a flamenca costume, because you really saw it like a flamenca costume. And, as a result of that, the craziness. I don’t know why it makes women’s shapes so pretty. It doesn’t matter if you’re a little fat as I am, skinny as my partner, tall, short. It has a form that makes you find your style and what suits you and it feels really nice to all the women on the planet. So I invite you to put on a flamenca dress. It is true that when you put on the dress, It makes you feel like when you’re a little girl and put on your dress for the first time. And that’ every day, that’s the way it is. Does the audience notice the wardrobe design? and they want to see your sole. Women and men, I really like that. because sometimes we think that those things are just for women and, not at all, there’s a lot of men who notice, they ask you. Where do you keep your wardrobe? I have this entire wardrobe. I’m a little embarrassed, because even if my classmates say “no” I’m very tidy. It is this part of here. because I have others in the Tablao. Here I also have the case with all the earrings, the combs and others. And here’s the other part. The flowers below, well, this whole using your feet is a dancers thing. And mantones (shawls) and other dresses. And all you have here are fabrics, because I like sewing well, the little I know. Doing nonsense with fabrics we do little things. it’s no good for anything either. It’s used for a lot of things, isn’t it, the bata? But, mainly, for Alegrías with a bata and shawl, it’s like the most typical thing. But I wear this bata for Soleá. I take it out for a Soleá. It seems to me more sober, more elegant. Alegrías are more festive, more canasteras. They demand another type of fabric, even brighter, more canastero. This one is more elegant, I really like it for a Soleá. For a Seguiriya too, with palillos. How does it move? It’s true… Well, look, I have a lot of students that the first thing they do when they wear the bata de cola. is to watch as the bata follows them, it seems the silliest thing, but a bata has a lot of technique. Moving the bata de cola properly is very difficult, demands a lot of technique. the most important thing, is to handle the bata yourself, don’t let the bata handle you. that you start giving blows and the bata goes where it wants. And you go behind, you stumble… When you have control, the bata goes where you want it and besides, it’s very difficult the different toques. Normally the bata should not be turned around. Another thing is that you do this way and turn it around on purpose, that’s gonna be obvious. But yes, in theory, you can see the tarlatana below, the movement is seen and it can be folded a little bit. The important thing about a shawl, to dance, is that the weight is on the fringe, not in the shawl. Actually, I have one at home and one at the tablao. Because as we lose many things, we have to replenish them. This comb with this earring, the flower and you’re already dressed. most of all because she makes them special for you. As time goes by the flowers they fall, the petals. I think this flower has two or three years. Of course, it costs you 10 Euros per flower. These are of carnations, but, you see, they fall in no time. It also depends on each dance, here are different flowers. There is the flower of all life, the rose, the carnation. They are lovely with a canastero. and when the flowers fall again many clients say ” Oh, that’s really nice.” and take them home. That’s nice, it’s a lovely memory. Does the public know the work behind it? They also have a cliché of sevillanas, of rumba, then they go to the Tablao and they say “I’ve been excited, because I didn’t expect this”. I encourage all spanish people to go to the Tablao at least once in his life. Just as you go to a discotheque, you go to the Tablao and have a drink, you drink wine…..